Madrid is trying to rectify remarks that the Spanish Foreign Minister has recently made in Algiers and that were deemed by Rabat as inimical to Morocco and to its standpoint on the Western Sahara conflict. Spain, whose relations with its Moroccan neighbor are excellent in all respects, has reaffirmed its “active commitment” to reach a “political, fair, lasting and mutually acceptable solution” to the Sahara issue. 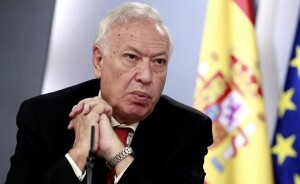 The Spanish Foreign Minister, José Manuel García- Margallo, who was on visit to Algiers on April 11 had seemingly backed Algeria’s position in the territorial dispute opposing it to Morocco over Sahara Western. Margallo visited Algiers to discuss the supply of Algerian natural gas to the European Union following the tension between Brussels and Moscow that was triggered by Russia’s military intervention in Ukraine. The Spanish Foreign Minister tried to soften up Algeria’s highest authorities to strike a gas deal that would benefit Spain in the first instance. An annual report on Spain’s national security, adopted on April 25 by the Council of Ministers, completely dissociates itself from the remarks made by the Foreign Minister during his visit to Algiers. In this document, the Department of Homeland Security reaffirms that “in accordance with UN resolutions, Spain, as a member of the Group of Friends of the Sahara, reiterates its strong commitment to achieve a political , just, lasting and mutually acceptable solution” to the Western Sahara issue. The report does not hint to “decolonization” or “self-determination” and focuses mainly on security issues and the dangers threatening Spain. Anyways, Spanish officials have accustomed us to talk out of both sides of the mouth according to the interests of their country, but it is up to Moroccans to sound the alarm whenever they notice any deviance. How you describe the sahrawi Situation in Tindouf camps?